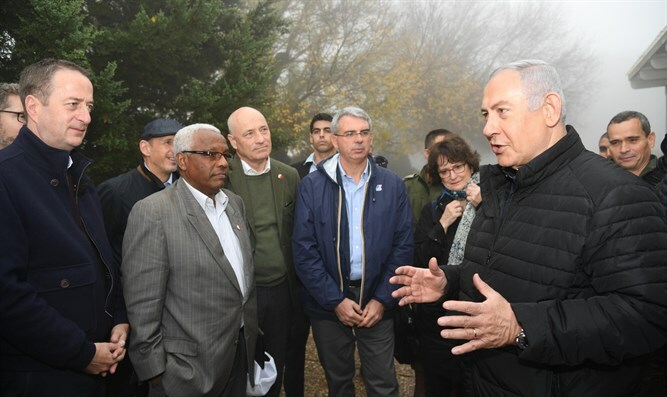 Netanyahu updated the ambassadors on the details of Operation Northern Shield and Hezbollah's intentions to use tunnels against Israel. He stressed that Hezbollah tunnels are one expression of Iranian aggression in the region. "We deny our enemies the weapons of the tunnels systematically and decisively, we are doing this to Hamas, to Hezbollah as well, and we will do what we need to. Whoever attacks us - his blood is on his own head. Hezbollah knows this and Hamas knows this," Netanyahu said at the end of the meeting. Netanyahu said he told the ambassadors that they should “condemn this aggression by Iran, Hezbollah and Hamas unequivocally, and of course also intensify the sanctions against these elements. This activity is at its beginning, but at its end this weapon, in which Hezbollah invested so much, will no longer exist and will not be effective." A diplomatic source added that the purpose of the ambassadors' tour was for Israel "to receive support and legitimacy for additional operations if necessary."